Today, I have the pleasure of introducing you to a very talented artist and founder of a fresh new sketching experience. His name is Lewis Achenbach and he is an artist, painter and the man behind the “Jazz Occurrence” music experience. 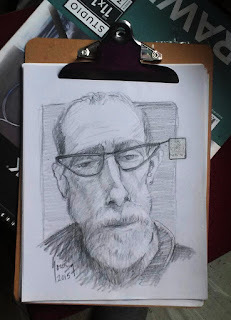 We’ll talk about “JazzO” a little bit later but I think you will find what he is doing to be quite inspirational and very much like urban sketching. I often see Lew with buckets of paints and brushes in his hand but other times he is sitting with a sketchpad and pastels or markers, capturing however the music moves him. So without further ado, let's meet Lewis! Wes Douglas (WD): Hello Lewis and thank you for taking the time to chat with me here today. I used to wonder, Lew, if what you are doing at the JazzO music events relates to “urban sketching” at all. I mean, you sketch on location, you draw/paint from observation, and you share your work online. Those are all Urban Sketching guiding principles and even one more “we welcome all styles and mediums.” That seems to fit within the urban sketching manifesto if you ask me. What do you think? Lewis Achenbach (LA): Wes, let me first define my versions of the terms ‘sketching’ and ‘painting’, or at least compartmentalize the two via process and media. I use those terms interchangeably. 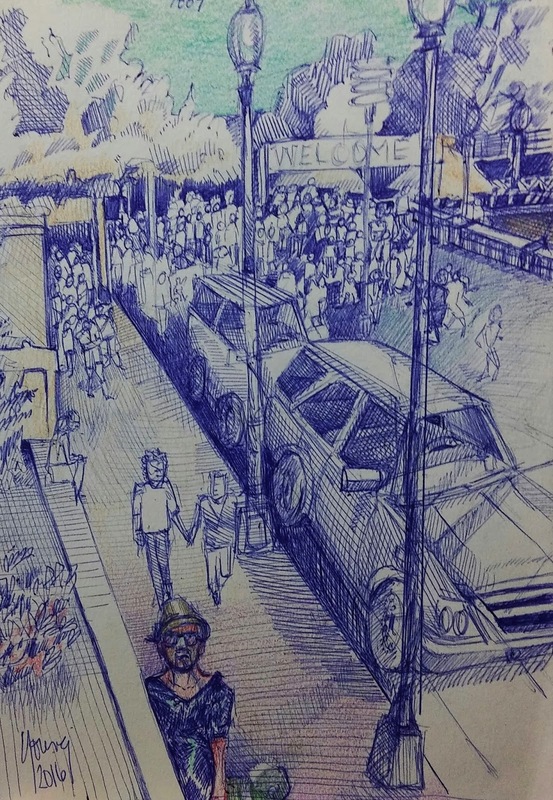 ‘Sketching’ always comes off as an informal enterprise compared to the high-art word weight of ‘painting’. It is creating that is getting done, and that is what should stand out. I don’t differentiate between black and white and color either. It’s either dry or wet. Dry is sketching. Painting is wet. That is how I categorize the process. And the gig usually dictates dry or wet. But I will use the term ‘sketch’ to make it simple. WD: Why do you sketch? How does it help you? LA: I create to music, mostly, or at least it is what I’ve become known for, which is cool with me. So I sketch to hear the music, in the way my brain likes to hear it. In general, I sketch to get a grasp on what is going on in the world. It’s my vehicle to understand; my default tool in my toolbox. Sketching slows thing down for me, so I can hear, and even rewind what I’ve just heard. I can look at a drawing the next day and residual hear the gig from last night, in a sense. LA: I like the caveman grit of charcoal, right now. Pastel, chalk too for the dry work. Acrylic is the functional wet on-sight media. AD markers for small moleskine sketches. WD: Where is your favorite place to sketch? LA: I love Constellation Chicago. It’s the vibe of the place. I feel welcomed there, to create. And I have a mental archives of great sound experiences from there. And they have me formally paint large scale on canvas. Which you cannot do without permission from the owner, and blessings from the musicians. So it’s a relationship thing too. Also, sketching on the beach is becoming a haven. And I like to combine the music and exterior spaces thing, which is why music festivals have become a favorite gig. WD: What is the inspiration for the sketches you selected? LA: Well, music is the simple answer. But it’s really knowledge that I seek through sketching, and wisdom through that. How else, as artists, are we to communicate to others, except through our gifts/talents/tendencies? I get to ‘tell’ the musicians how I have just felt about the live performance, by showing them a live document of my experience. I dialogue through visual means. So my inspiration is also the ability to ‘be heard’. WD: Why are these scenes special to you? LA: So the artworks are special because they represent a personal memory (a concert) but they also embody this impossible task and continuing adventure. The task of capturing fleeting live music while it’s lingering in the air. And the adventure of documenting this impossible gig: trying to sketch something that doesn’t really visually exists (except in my imagination). And I’m trying not to force the colors and forms onto the music. I let the music tell me what to do. What colors and line quality to use. The music tells me what personal references to touch on, and use as push off points, to create an authentic artwork, where I am just a vessel, present in front of the paper/canvas, getting the music ‘out’. If that makes any sense. LA: I do a decent amount of organizing, networking and self promotion. Which has all to do with the Jazz Occurrence project; where I produce events so that I can curate and paint larger scale next to the musicians, and really physically get ‘into’ the music. If I am part of the show, I can cut loose and even influence the music happening in appropriate ways. I also educate; teaching improvisation and ways/means of cross influence and collaboration with students. And I paint houses. And I have a small animation studio in my basement, where I do free-lance animations and videos for various corporate franchises. It’s all brush in hand, clay in hand, col-erase pencil in hand kind of work. Actually the live music (in the moment, broad brush stroke) sketching bore out of a necessity of contrast to the tight pencil on paper draftsman day job of animating at a studio in NYC. But that’s another story (and I wont get into getting arrest for graffiti on the lower east side during the Mayor "Rudy" Giuliani administration). WD: If anyone wants to follow you or to find out more about Jazz Occurrence, do you have any links online? WD: Lewis, I greatly appreciate the time you’ve given us here today and I really enjoy how your Jazz Occurrence project has redefined common perceptions of what a “sketch” can be. I look forward to the next time you and I can hang out with one of your group of jazz musicians and sketch together. Wes Douglas (WD): Hello Lewis and thank you for taking the time to chat with me here today. 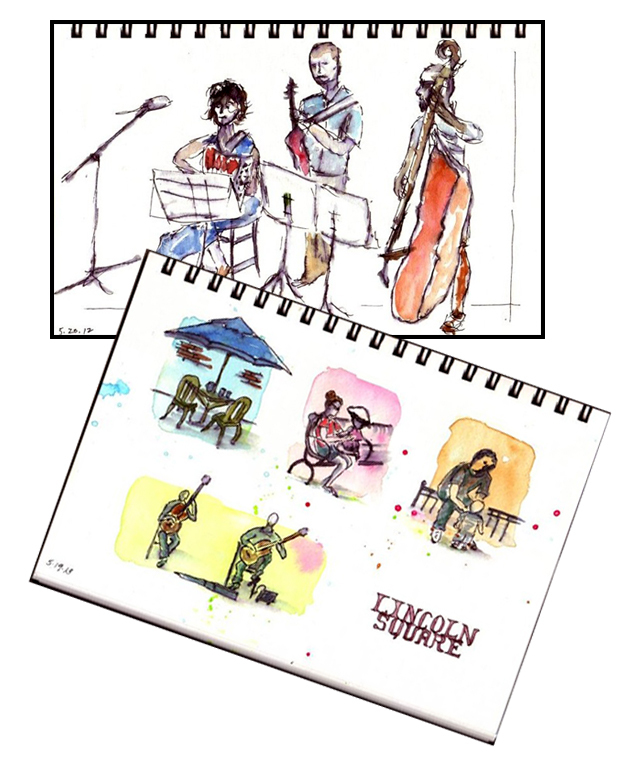 I used to wonder, Lew, if what you are doing at the JazzO music events relates to “urban sketching” at all. I mean, you sketch on location, you draw/paint from observation, and you share your work online. Those are all Urban Sketching guiding principles and even one more “we welcome all styles and mediums.” That seems to fit withint the urban sketching manifesto if you ask me. What do you think? If you’ve attended a Chicago Sketch Seminar you know Mary Lanigan Russo as the remarkable registrar, tireless question answerer and desk anchor. Now, let’s shine the spotlight on Mary, Urban Sketcher and photographer. Barbara Weeks: Hi Mary, welcome to the spotlight. Thank you for agreeing to the interview. Let’s jump right in! Tell us a little about yourself. Mary Lanigan Russo: I was born and raised in Chicago – a proud South Side Irish White Sox fan. I have a wonderful husband, Rick, and I am mother to three fabulous stepchildren, and grandmother of four. My sister, brother, and I have thousands of cousins, and we love them all. I’ve had many jobs over the years, and apart from 5 years in Los Angeles, I have lived only in Chicago and a few suburbs. Barbara: I know you’ve been part of Urban Skechers Chicago since the beginning. What prompted you to join USk Chicago? Mary: I had been immersed in photography since the year 2000, printing in a darkroom, later digitally, and participating in art fairs. After my son passed away in February of 2012, I completely lost interest in photography (and everything else), and decided a change was needed. 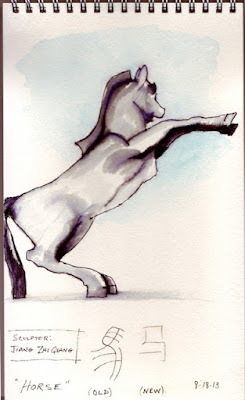 I heard about USk Chicago from a watercolor teacher, who included a link to USk Chicago in an email. I joined immediately by showing up in Lincoln Square in May of 2012. Barbara: Many of us turn to sketching in times of stress. I’m glad you joined us. I remember that day in Lincoln Square and your sketch from that day. It’s great that you shared it here! What else attracts you to sketching? Mary: I always loved to draw when I was young. As an adult, it has been an excellent form of therapy for me. It’s sad that life sometimes gets in the way of creative pursuits, and I am very happy to be drawing again. It really takes you out of yourself when you concentrate on creating art. Now I sketch because I enjoy the process, the outcome (usually) and the company (always!). Barbara: Do you have a favorite sketching medium? Mary: I have always enjoyed drawing with pencil. But, I am also having a lot of fun sketching directly with ink, and then adding watercolor. If I couldn’t use pencil, I would probably just draw with ink - and let the mistakes be! Barbara: Do you have a favorite subject matter? Mary: I don’t think I have a favorite subject matter. 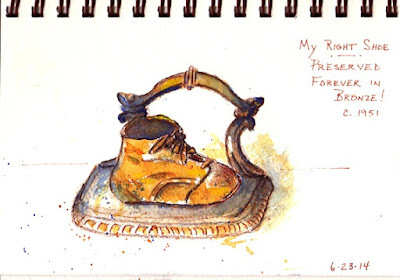 I seem to do my best sketching and painting when my subject has personal meaning to me - e.g., an antique child’s rocking chair from my cousin’s farm, my bronzed baby shoe, my family. When my son died, I joined the Sketchbook Project and dedicated the sketchbook to his story. Special projects seem to motivate me and hold my interest. Barbara: If you could sketch anywhere in the world where would that be? Mary: Ireland, of course! 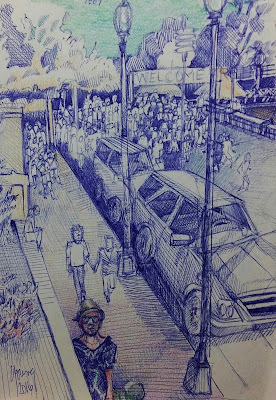 I have only visited once, before I started sketching with Urban Sketchers. It is a beautiful country, and it feels like home. Barbara: Is there an artist that has had a great influence on your work? Mary: There are so many! Not that I am able to emulate them, but I love the work of Mary Cassatt, Renoir, Degas, Caillebotte, Homer, among others - and contemporary painters like Mary Whyte and Charles Reid (my two favorites). I also idolized my art teacher in high school, Sister Mary Chiara, who did beautiful watercolors of Italy. I have to say that the sketchers in Chicago are the most wonderful, and more immediate, influences. There is an incredible amount of talent and sharing in this group. Barbara: Caillebotte and Charles Reid are at the top of my list, too. I agree with you about the sketchers in this group. They are immensely talented and generous in sharing their knowledge! Is there a sketch you are most proud of? Mary: I still like the very first sketch I did with USk Chicago! Maybe that’s because it was the beginning of a beautiful friendship with sketching and sketchers. 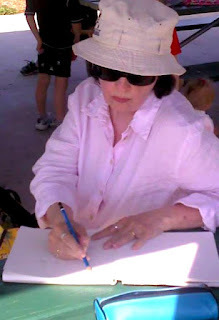 Barbara: Do you have a tip to share for sketching on location? 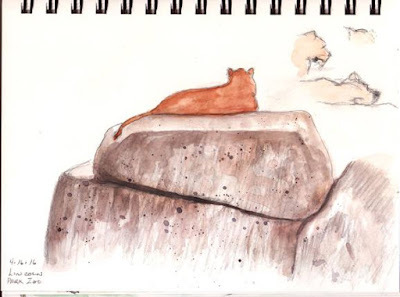 Mary: I was a little apprehensive about sketching on location, but I soon realized that a) no one cares what you are doing, as long as it does not disturb others, and b) when people do pay attention to you and your sketching, they are always complimentary! So, my tip would be, don’t worry - be open to enjoy the moments, especially when children join you and ask you to draw something for them. In Chinatown, a six-year-old boy commissioned me to draw the red Angry Bird for him. His older sister then drew the modern Chinese symbol for “horse” next to my sketch of a horse statue. Great fun! Barbara: I know that sketching is only one of your art endeavors. Will you tell us a little about your other art projects? Mary: I am still learning about watercolor painting. I am working on painting portraits of my four grandchildren. And, I have recently decided to draw all the places I’ve lived - which is a very long list - and I plan to have them in a Japanese-style, accordion-fold sketchbook. I plan to use different media like graphite, colored pencils, light watercolor, etc. I also enjoy making journals, which I give as gifts. I recently learned how to do the Coptic stitch in Jodie McGovern’s workshop this past July, so I will be using that technique in future hand made journals and sketchbooks. Barbara: Are you still pursuing photography? Mary: I’m still hooked on photography and have been since I was a child, taking pictures with my parents’ Brownie camera. I received my very own Brownie Starmite when I was 12. (I still have it!) I continued to annoy all family members with stealth photography for years. After taking photography classes from 2000 to 2003, my husband built a darkroom in our basement, and I began to produce fine art photos, which I sold at various exhibits. I transitioned to digital photography around 2006, and continued to sell both silver gelatin prints and giclee prints at art fairs and private exhibits. My photos of Ireland are the most popular. Barbara: We know you’re on Facebook and post to Urban Sketchers Chicago. Are there any other social media accounts where people can see more of your work? Mary: I do have a blog, which I have completely neglected for the past two years. I am planning to start blogging again by adding my current project to the blog, which can be found at theartseen.wordpress.com. I am also on Instagram as mlrphotos. Barbara: Thanks, Mary, for taking the time to do this interview and sharing your experiences with us. Hope to see you at the next sketch meet! About a week or so back I sent Daniel my interview questions, a set similar to the one all our interviewees get. Instead of answering my questions in sequence Daniel sent me a story. I know Daniel for a couple of years, so I was only briefly surprised: being unique is his normal way of being. So I have for you - Daniel Young, his self portrait, his story and work. One of my goals in biking across country was to return to Chicago (the best city in the country, IMO) and turn some of my photos into paintings. But upon returning I soon faced the fact that my vision for the paintings was way beyond my ability to paint them. I had always been into the arts, but pencil was always my choice of tools and still to this day it's the medium I feel most comfortable using. Which is why I'm enjoying things like the ball point pen. If I'm comfortable, I'm not growing. Okay - the solution was easy. Learn to paint. The first step for me in learning how to paint Well was to return back to the basics and learn how to draw well. I already knew that meant practice practice, practice. So I was happy to read an article, posted by Alex saying that "Talent" was about 10,000 hours of practice. That equates to about 5 years, and at 57 years old I needed to get a move on it. So I started drawing everything, all the time, even earning the name "the guy that draws all the time". Also after returning to Chicago, re-entry into a non-nomadic life proved to be a bit more challenging than I originally anticipated, so drawing became a great escape for me. People are my favorite subject matter and I love coffee, so Starbucks was the perfect blend.. It was at a Starbucks that Hope Hanley first introduced me USK. For me, sketching had become an adventure. An adventure very close to cycling; each moment was completely brand new and you never know who or what you'll run into around the corner or over the next hill. But up to this point I had never met another sketcher. Why was I the only one out there drawing? I chalked it up to not owning a TV or a smartphone. And kept drawing. But to have Hope give me hope that there were others out there too. I wasn't the only one! I have to admit I leaned against the table to maintain my balance which had all the sudden gone wacky due to my weak knees. And I'm not kidding. The ceiling to Starbucks opened up to angels sang Hallelujah hallelujah hallelujah. Need I say more? I've been hooked ever since. This group has such a wide variety of artists, I'm constantly being pushed in new directions as I travel with them in their adventures And that THRILLS me. You can't help but to become a better artist, just by being around them. USK has also changed my vision on what painting is all about. 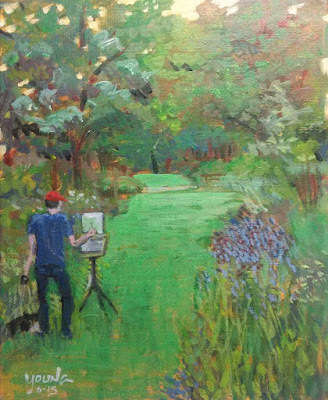 Plein air painting in the park by the Zoo. The artist in the painting is Charlie Critchelow. Alex Zonis: Thank you for sharing your story, your talent and your sketches with us, Daniel. I happen to know that you will be co-hosting our sketch meet next week, this is just great - our sketchers can meet you in person! Paul: Thanks for participating in our Spotlight Sunday interview, Dana. 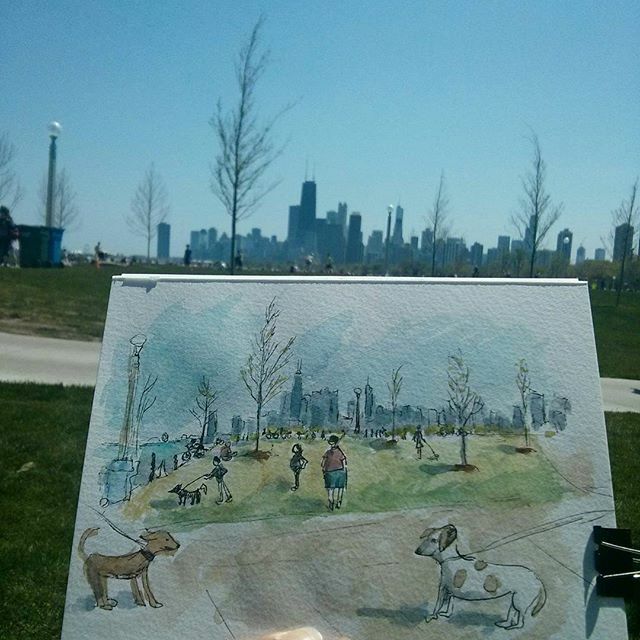 Can you tell us how you found Urban Sketchers Chicago? 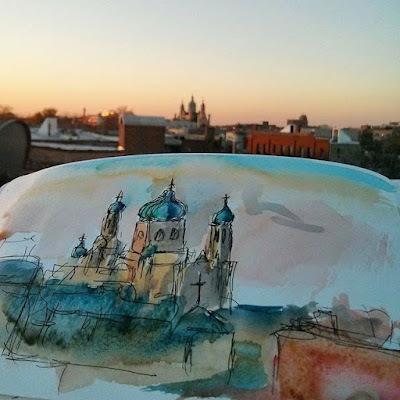 Dana: A few years ago I discovered Urban Sketchers on Instagram and really enjoyed seeing different places around the world through the eyes of artists. 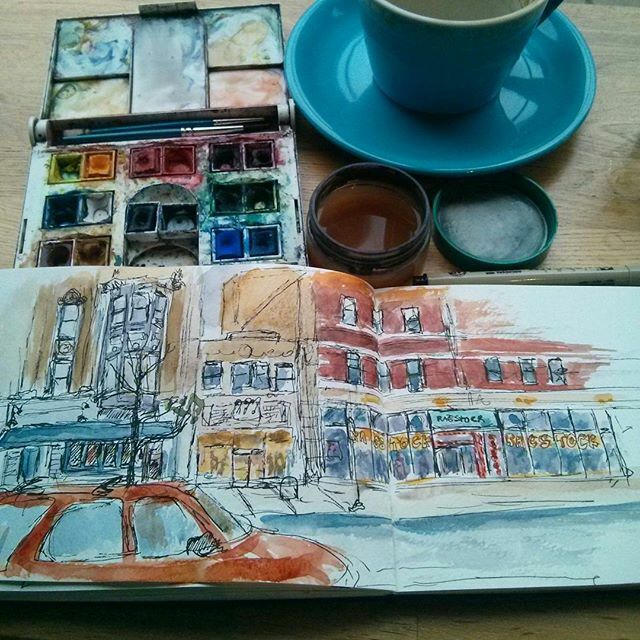 When I moved to Chicago last year, I started looking at the Chicago Urban Sketchers sketches on Instagram. It was really fun to see all sites around the city that people were drawing. Paul: Can I ask where you moved from? Dana: Sure, I lived in Bondi Beach Australia (near Sydney) before moving to Chicago. Paul: Very cool. And you also told me that the photo of you sketching (above) was taken in Gnarlaloo, Western Australia. Can you tell us why you like to sketch? Dana: I love to sketch, it is a great way to really see and remember a place. If I spend 15 minutes observing and sketching in a place I remember the smells, sounds, people when I look back at that sketch. For me it is very relaxing to draw. 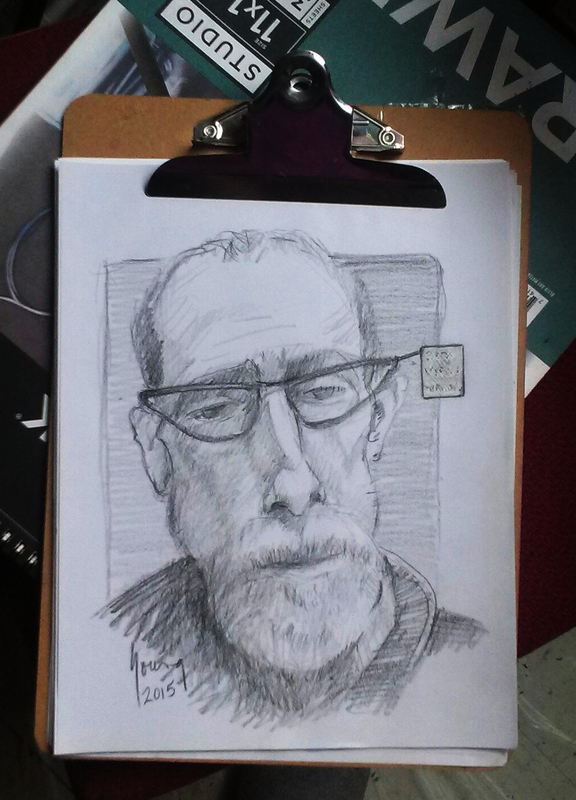 Paul: Do you have a favorite sketching tool or materials? Dana: A small watercolor pan set that I have had for over 15 years, ink usually a micron pen or quill with ink and I really like the fabriano water color blocks. They travel well. Paul: What would be your favorite place to sketch? Dana: I love being by the water and Chicago has great spaces by Lake Michigan where you can see the skyline. Millennium and Maggie Daley Parks are also great green spaces, and people watching! Paul: You sent us four urban sketches. What inspired them? Why are these scenes special to you? 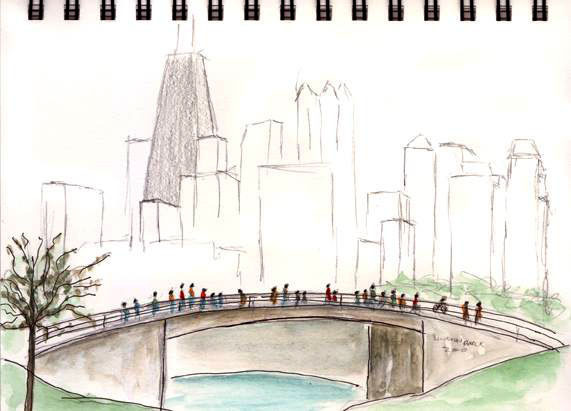 Dana: Sketch 1 - Lincoln Park, one of the first real summer days in Chicago, it was great people watching, everyone was out enjoying the day. I had walked along the lake front and it was a great place to rest and enjoy the view. 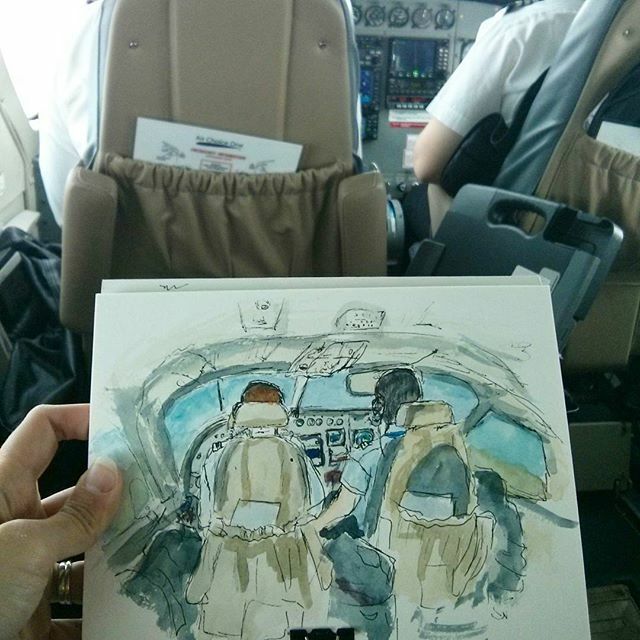 Dana: Drawing 2 - The view from my seat on Air Choice One. I had the opportunity to fly with this tiny airline that flies from Chicago. The view over Lake Michigan and the skyline coming into Chicago was fantastic. 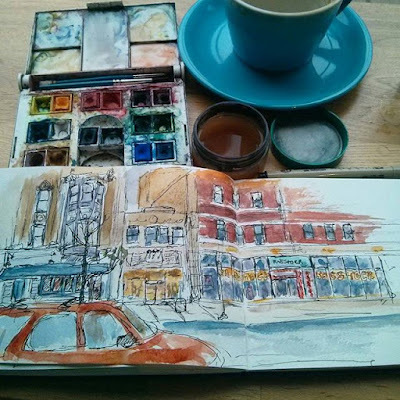 Dana: Drawing 3 - Chicago has a lot of great cafés, and most don't mind of you sit and sketch. This image shows my basic set up that I carry with me every day just in case I have a few minutes to sketch. Dana: Drawing 4 - Ukrainian Village Church. I drew this very soon after arriving in Chicago, I was up on a roof in West Town. I loved the light and overview of the neighborhood. Paul: What do you do when you are not sketching? Dana: When I'm not sketching, I work on freelance projects and enjoy being active outside hiking, walking, and spending time with family. I really love pleinair oil painting too.